NOTE TO INSTRUCTORS: You may have students email their work to you by having them place your school email address in the form, or have your students print out their work and turn it in. Once the student "Submits" their work, it is emailed to the address entered into the form and may be printed out. NOTE TO STUDENTS: Follow the instructions carefully and answer to the best of your ability. This exercise should take about 70 minutes to complete. When you are done click the "Submit Data" link at the bottom of the page. IF you do not, your work will not be saved! The Average Soldier was a white, native-born, single, protestant, male farmer between 18 and 39 years of age. He stood about 5 feet 7 inches tall and weighed about 145 pounds. Union soldiers were known as "Billy Yank" while their Confederate counterparts were called "Johnny Reb." The average age of a Civil War soldier was 25. 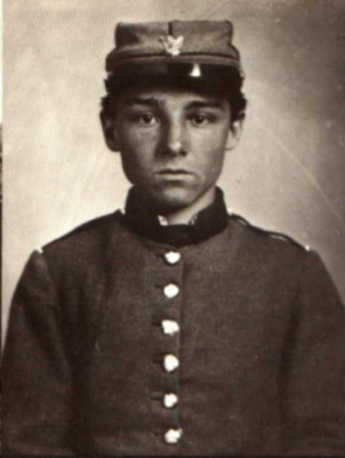 In the Union Army it is estimated that 100,000 soldiers were less than 15 years old. These soldiers had to lie about their age to get into the army as the minimum age was 18. 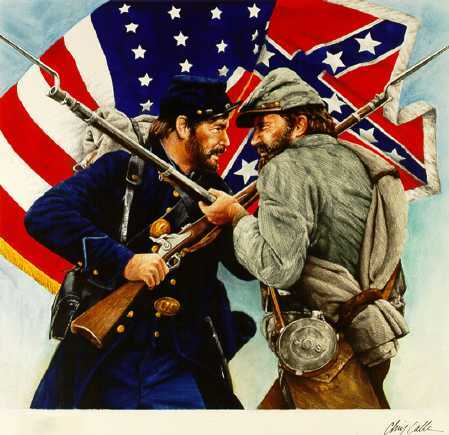 About 3 million soldiers fought in the Civil War with 2 million fighting for the Union and 1 million for the Confederacy. Fifty percent of the soldiers were farmers before the war. Some regiments were made up almost entirely of farmers and farm laborers. Union and Confederate rosters contained references to more than 300 different careers, including: locksmith, teacher, carpenter, shoemaker, black- smith, painter, mason, brewer, teamster, and mechanic. More soldiers died on their backs in hospital beds of disease than on the battlefield. The average Union soldier stood a 1 in 8 chance of dying due to illness and a 1 in 18 chance of dying in battle. 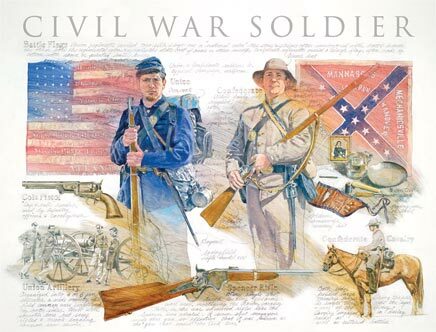 Confederate soldiers faced a 1 in 5 chance of succumbing to disease and a 1 in 8 chance of dying in combat. Civil War soldiers had to endure not only combat, diseases, and wounds, but also poor medical treatment, grueling marches, heat stroke, sometimes months with no pay or shoes, harsh winters, little food, and only filthy water to drink. While not in battle, drilling, or standing guard, soldiers spent their free time indulging in card games (gambling was a daily activity for a majority of soldiers), reading, pitching horseshoes, or team sports such as baseball-which became extremely popular among Union soldiers with tournaments becoming common by the end of the war. But while on the march during a campaign, soldiers were usually limited to reading and writing, performing guard duty, drilling, and sleeping. Despite regulations against it, soldiers sometimes kept pets with them including dogs, cats, squirrels, raccoons, and other wildlife. The 8th Wisconsin Infantry Regiment carried a pet eagle with it at all times. Food was a common topic in letters home. Rations usually were meant to last three days while on active campaign and were based on the general staples of meat and bread. Meat usually came in the form of salted pork and sometimes beef. Army bread was a flour biscuit called hardtack, re-named "tooth-dullers", "worm castles", and "sheet iron crackers" by the soldiers who ate them. Hardtack could be eaten plain though most men preferred to toast them over a fire, crumble them into soups, or fry them with their pork and bacon fat in a dish called "skillygalee." Coffee was a most also an important staple and some soldiers considered it (and sugar) more important than anything else. While on the march, if there wasn't enough food, soldiers often did what was called "foraging," whereby they would spread out in teams and scour the land in search of food; Union soldiers while in enemy territory most often practiced this. Soldiers reported bringing back to camp: chickens, hogs, cattle, vegetables, fruits and all kinds of treats taken from local farms and plantations. Though very few Soldiers had much traditional education, yet 85% of them could read and write. This lead to an unprecedented amount of letters written from soldiers home to loved ones. Over the course of the war, some regiments were capable of producing 40,000 letters or more, making the Civil War one of the most documented events in our nation's history. The arrival of mail in camp was a cause for celebration no matter where the soldiers were and there were discouraging words when mail was not received. Letters from home were one of the most important events for soldiers. It was their only source of normalcy and reminder of the life they left behind. Reading newspapers was important and sometimes soldiers paid up to one dollar for a copy. Some soldiers also become correspondents and wrote home to their local newspapers documenting the war, much like modern-day embedded reporters do. After payday, Union soldiers often spent time at the sutler's store where they could purchase toiletries, canned fruit, pocketknives, and other supplementary items, but usually at exorbitant prices. By mid-way through the war the average soldier's salary amounted to about $13.00 per month and sometimes it did not last long with expenses for clothing, food items, paper, stamps, and newspapers. 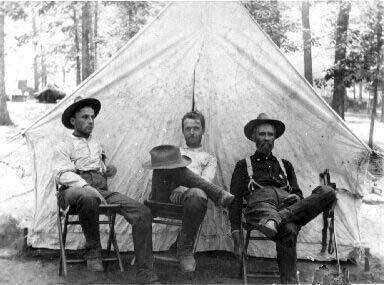 Unfortunately, Confederates did not have the luxury of sutlers, they had to depend on the generosity of folks at home or farmers and businessmen near their camps. This led to major hardships as the war dragged on and people were less able to help. The Civil War was not only a contest between white native-born Americans. Tens of thousands of newly arrived immigrants fought in the war and mostly for the North. In 1860 nearly a third of the Union's male population was foreign-born. One in four Union soldiers was either foreign born or a second-generation immigrant. Indians were also strongly represented in both Union and Confederate armies. Of course, the largest non-white groups to fight in the war were African-Americans. 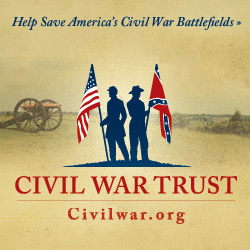 The Civil War had many causes, but without slavery there would not have been a war. 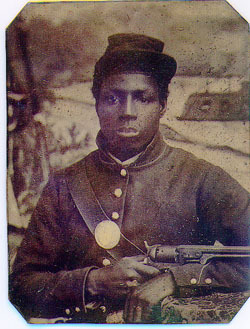 By war's end at least 180,000 blacks joined the Union army making up 9% of its fighting strength. They were organized into all black regiments and were commanded by white officers. These soldiers played an important role, fought as brave and as well as any white regiments, and were credited numerous times for winning battles. James M. McPherson, "For Cause & Comrades: Why Men Fought in the Civil War", Oxford University Press, 1997. James I. Robertson, Jr. "Soldiers Blue and Gray", University of South Carolina Press, 1989. Bell Irvin Wiley, "The Life of Billy Yank: The Common Soldier of the Union", Louisiana State University Press, Baton Rouge, 1952 & 1978. Bell Irvin Wiley, "The Life of Johnny Reb: The Common Soldier of the Confederacy", Louisiana State University Press, Baton Rouge, 1943 & 1978. John D. Billings, "Hardtack & Coffee or The Unwritten Story of Army Life", Benchmark Publishing Corp., Glendale, NY, 1970 (reprint). Step 4 > Read and consider the following letters (linked below) and come up with at least 5 different motivations expressed by the soldiers for entering into military service. NOTE: the links below will open into a new browser window. Step 6 > Finally, using the "Subject" search found here, and using the research you have already completed, write a brief report below (at least fill the box provided below) on: How were Johnny Reb and Billy Yank similar and/or different?